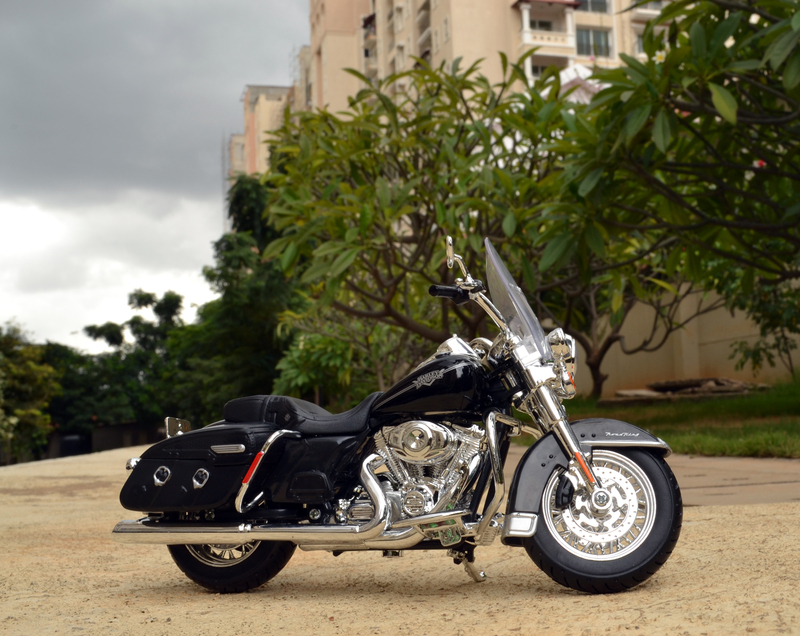 The Road King Classic is a touring bike made by Harley-Davidson, an American motorcycle manufacturer know for a very long heritage of riding. 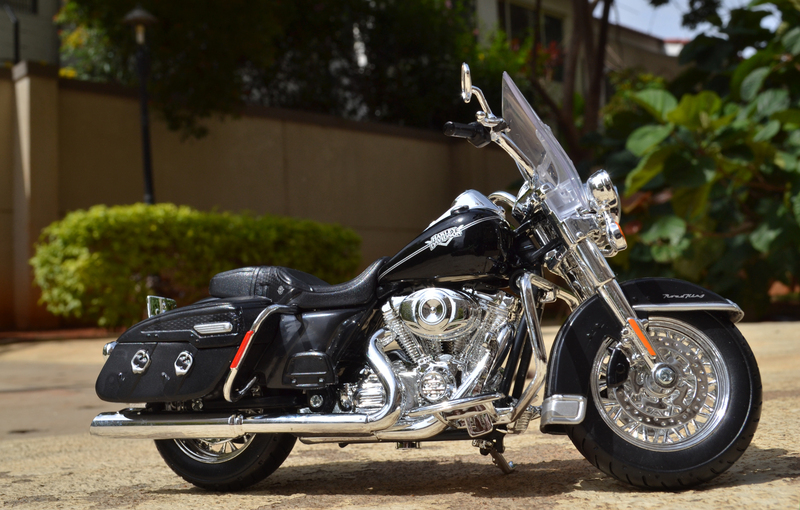 This 2013 Harley-Davidson FLHRC Road King Classic model takes the nostalgic look and feel of the Road King a little further with extra details for this road-worthy touring bike like leather-wrapped water-proof saddlebags, chrome fuel tank console, tooled metal detailing on the fender, tank, and chrome laced wheels with wide whitewall tires. 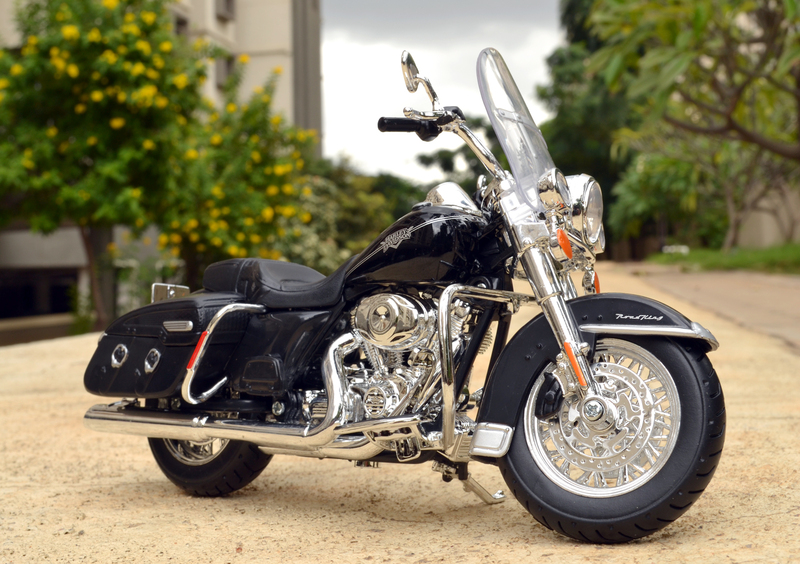 Powered by a 1690CC twin cam 103™ engine with integrated oil cooler produces a substantial power/torque figures for those long cruise. It also comes factory fitted with smart security system and ABS. 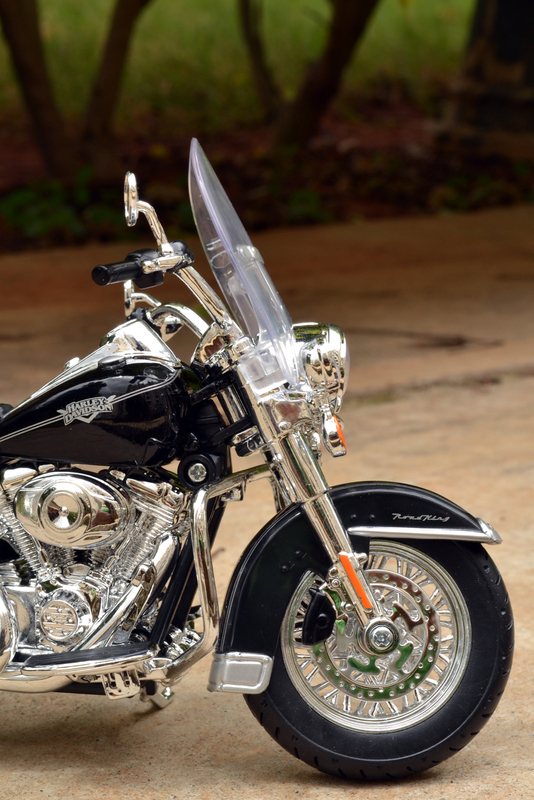 Being a Harley-Davidson it sports tones and tones of chrome where every possible… The chrome wired wheel are nicely done though they are a little over scaled but in this budget this is awesome work. The chrome treatment in the brake disc is wonderfull, the disc pattern is accurate and the drilling takes it to a different level. The HD logo on the tank is sharp, but I guess it is a little over sized! Only miss out that I could make is the white wall tire(I might do it as a mod) that is gave the original bike 1950s boulevard look. The head light looks too good and so stylish to look at thought the clear lens nature is lost in the process. The trademark wide windshield is fancy yet nice. 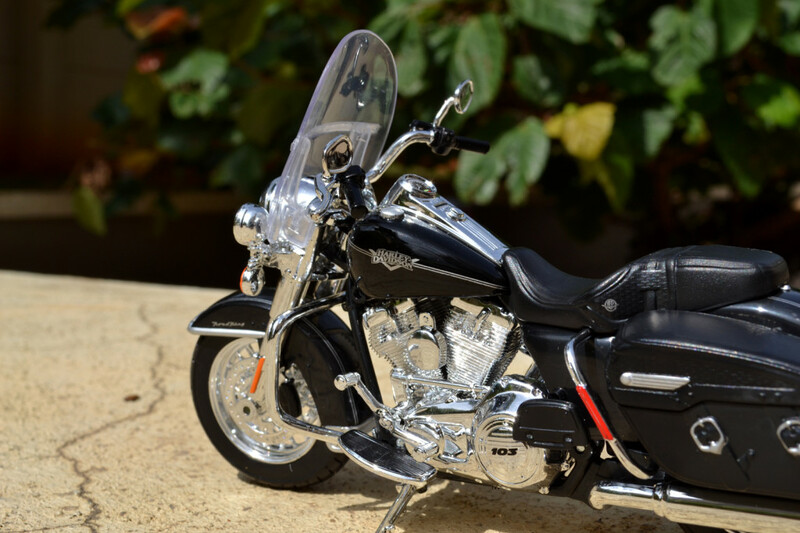 Tank-mounted fuel gauges that boast traditional styling in the real bike also add value in this diecast scale model as well. 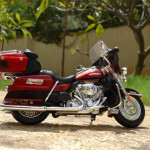 The speedo readout and the chrome treatment around it are of top quality and on par with the rest of the bike’s quality. 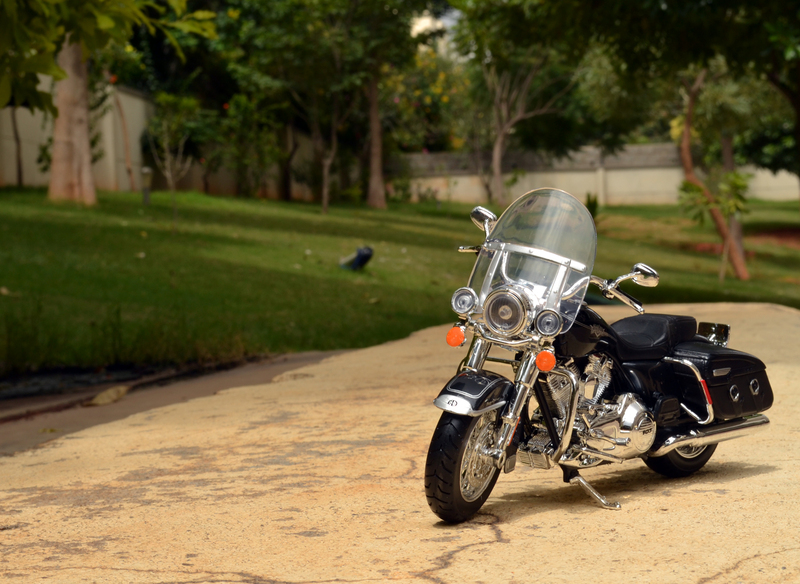 The size and scale of this model is almost accurate and the aspect ration is maintained well. The conventional floor board like footrest is nice and the rubber detail on it works well. Also the engine and body guard with reflectors are smart. 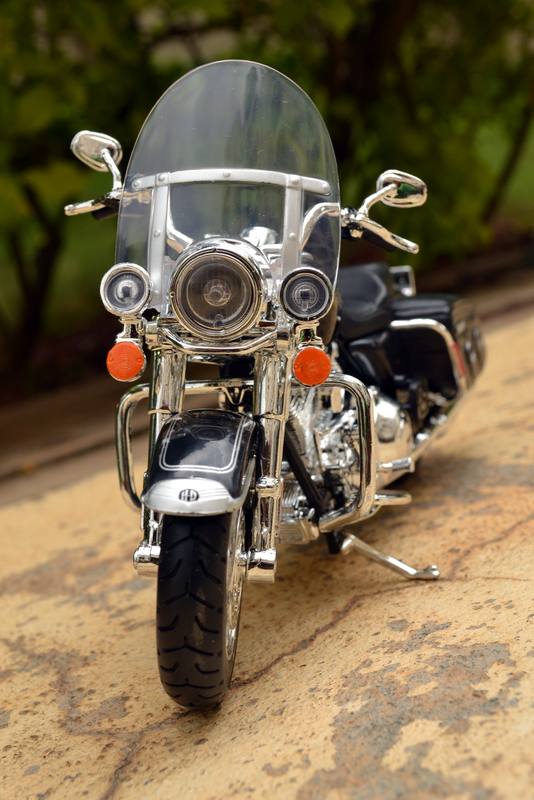 The 1690CC twin cam 103™ engine is finished in high gloss chrome and other details like the air cooling fins are too good. 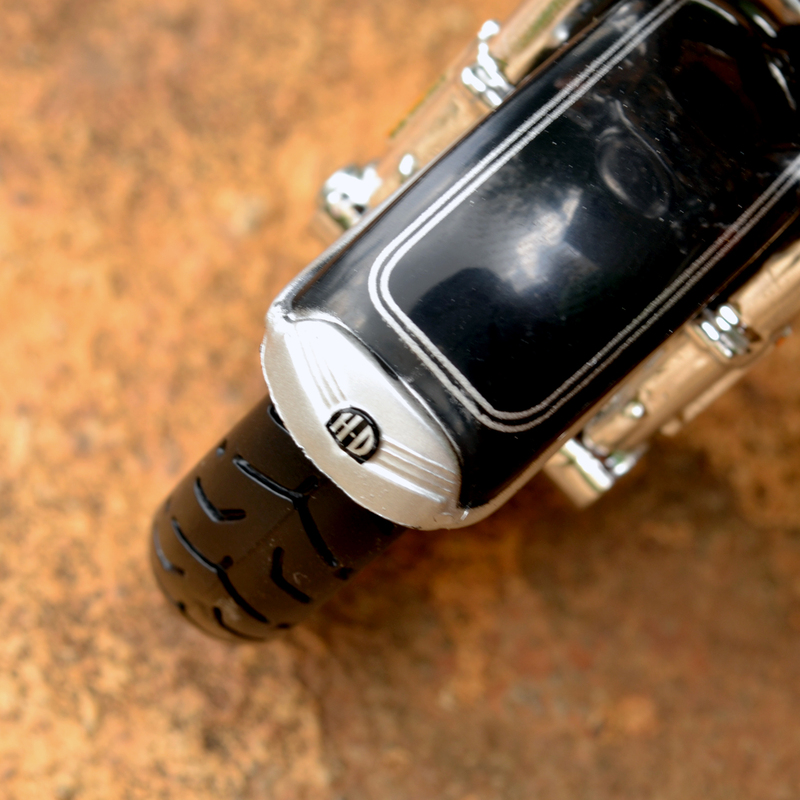 The engine crank case is engrave with the Harley-Davidson’s “HD” logo looks cool if viewed closer. The left side of the engine transfer box holds the 103 in block black and the gear shifter connector are also in proper place, though a little off scale. The passenger footrest is also in place but in a folder position. 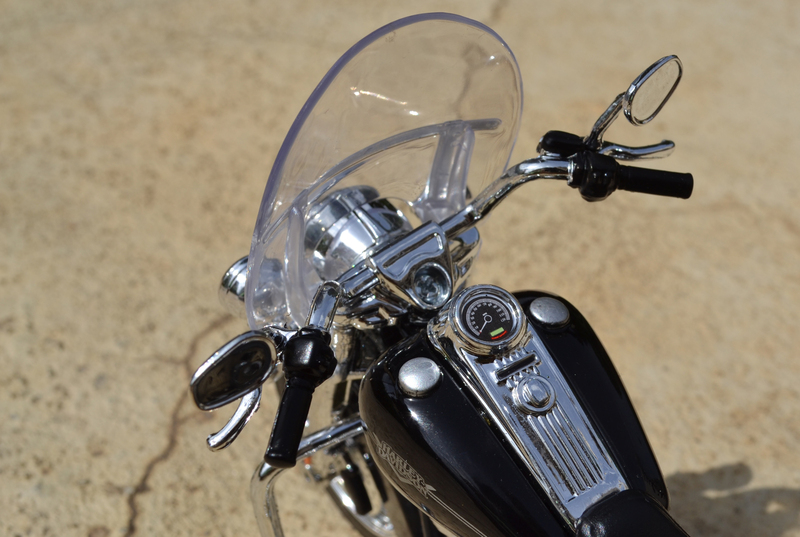 The leather-wrapped saddlebags details are awesome as it is finished in mat black it just pops out like the real deal. 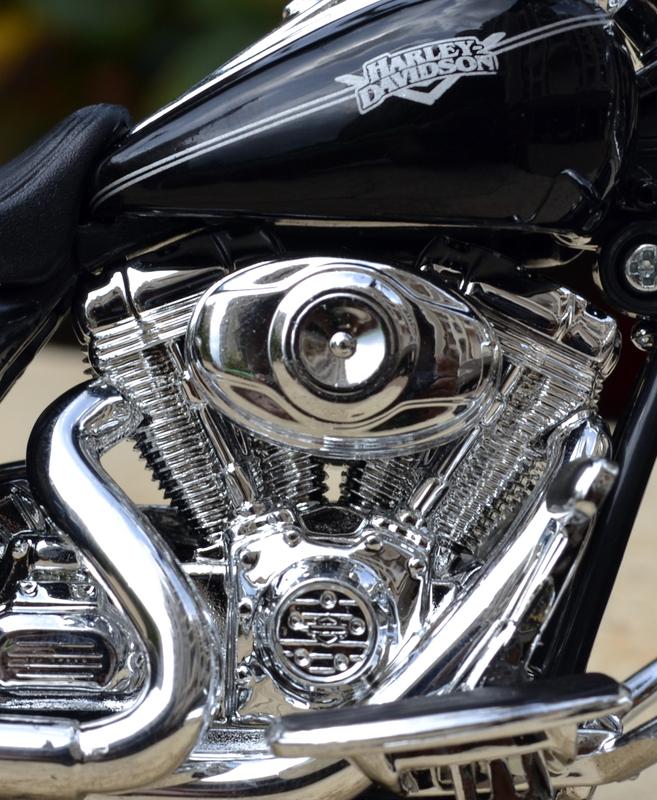 One other detail worth mentioning is the “HD” logo engraved front and rear fender, that is also finished in a aluminum shade giving some character to it. Another defect that I could make out on the fenders is that shading is a little different from the gas tank. 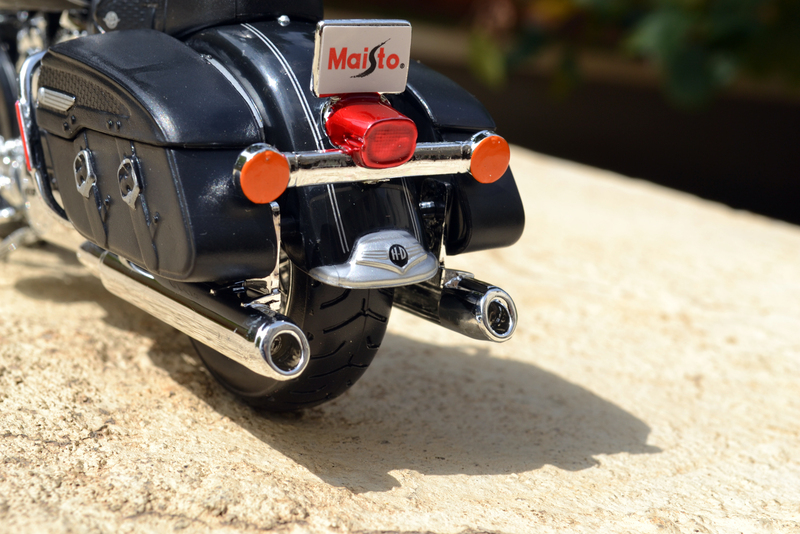 I am not a big fan of cruisers and touring bikes, so Harleys are not even in my hit list but the very reason I was exited when the news of Maisto’s plan for these beauties is that I wanted to check them out in flesh! 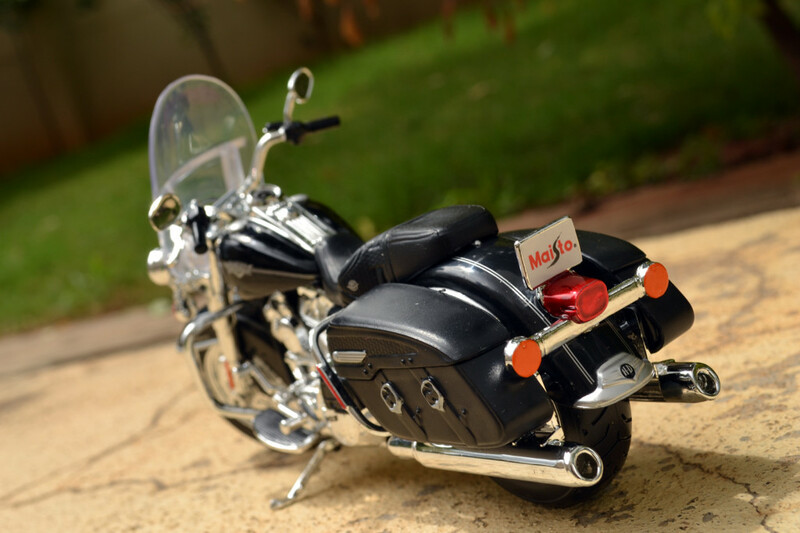 This Harley-Davidson 2013 FLHRC Road King Classic along with the 2013 FLHTK Elextra Glide come home on a very same day, even though these are almost double(at INR.1195/-) the price of other Maisto 1:12 scale model bikes… that is the kind of addiction that any Harley would create on first sight. 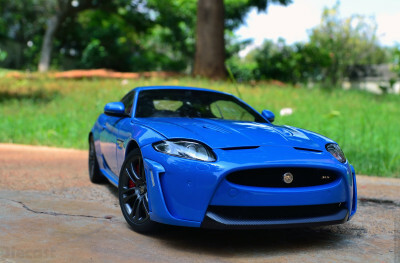 And finally its verdict time… This model though expensive, is worth every penny for its legendary value and the rattling presence, so I give these models a generous 4.5/5. 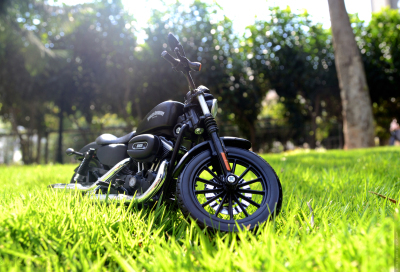 This Maisto lost that .5 points for not including the white wall tires or else this would have been a perfect Harley for any budget collector. Thank you for the review and the great pictures. I had been considering purchasing this replica, but wasn’t sure how good the quality was. Looks like they did a pretty good job on this model, lots of good features, though a lot of room for improvement too. With some touch up paint here and there, this one could be a good addition to a collection. This is by far the best 1:12 Maisto but there is still a lot scope for improvement!! BTW thx for the comments and support. I have a question, where do you bought it? I’m looking for ZX-6R online, but all I found are blue or red.. I’m dying looking for green one.